In present day world, wind power has become one of the rapidly growing energy resources and have even become challenging to the other conventional resources and now have become more quieter and efficient too. A revolutionary change in the wind power generation sector is the introduction of offshore floating wind turbines and the idea was given for the first time by Prof. William. E. Heronemus at the University of Massachusetts Amherst in 1972. Based on this concept, the first offshore wind turbine was set in 2008 by Blue H Technologies and it was a prototype deep-water platform with an 80KW turbine off Puglia in Italy. But it was decommissioned by the end of 2008 after collecting the necessary test data on wind and sea conditions. Thereafter, came the word’s first operational offshore wind turbine, Hywind, of 2.3MW capacity in 2009 in Norway with its installation credit bagged by Statoil. It was then followed by many such successful implementations by leading ventures like Wind Plus. As we all know, offshore winds are much more powerful as well as consistent and hence it renders a great opportunity for engineers to make use of it to meet the tremendously rising energy needs to a great extent with less aesthetic impact. From this, one could infer that the wind power is proportional to the cube of the wind velocity. Since, offshore wind velocity is greater than that of onshore, it became evident that more power could be obtained thereof. At first, limitations in technologies made it’s installation limited to less deep waters, but nowadays, deep and ultra deep water deployments have become a reality to access more denser resource. 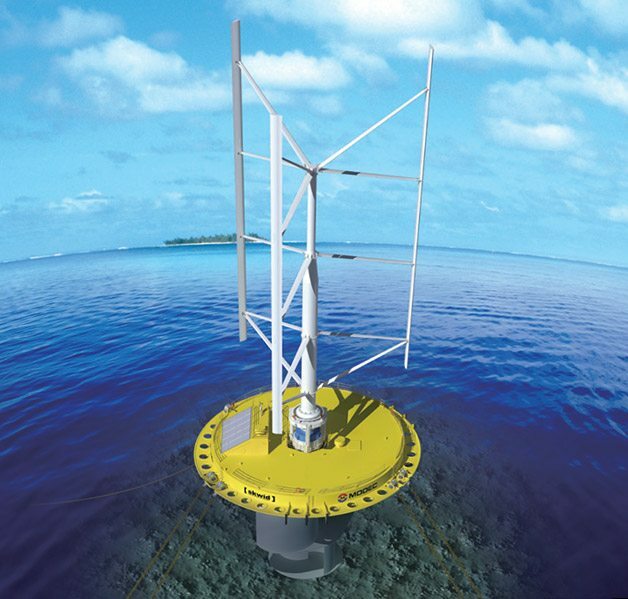 The wind turbine is mounted on a floating platform and is moored to the ocean floor. Also, there is an anemometer at the top of the turbine to record the speed and direction of the wind. Commonly, there are three principal ways of anchoring this floating structure viz: tension leg mooring system, catenary mooring system and ballasted catenary mooring system. The tension leg platform (TLP) is meant for the vertical mooring of the floating structure so that it virtually eliminates the vertical motion of the structure. The floating platform is here permanently fastened by group of tethers, called tension leg, at each of it’s corners. This type of mooring considered to be cost effective too. But the most common type of mooring in shallow waters is catenary mooring and the suspended weight of these mooring lines provides the restoring force, hence efficiently fastening the floating structure. In order to achieve more stability, ballast weights are employed to add additional cable tension and thereby stiffness to the floating structure. 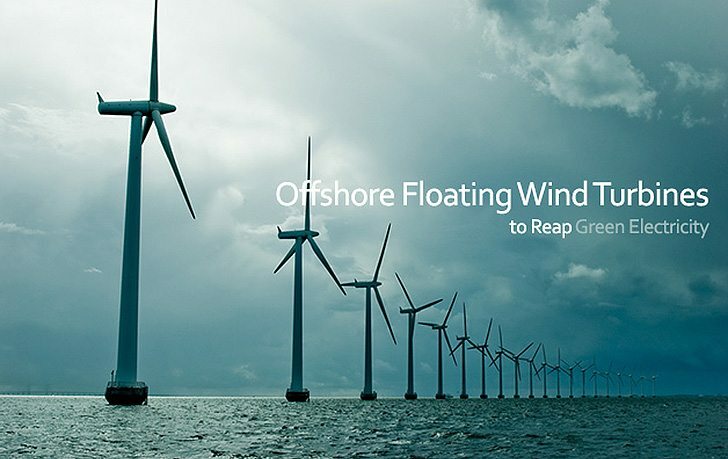 Since to contribute a considerable amount of power, a number of wind turbines have to be employed which collectively results in an offshore floating wind farm. And the power developed in these wind farms are transmitted to onshore grids via underground cables. Actually, the rotating blades are connected to a rotor which is inturn attached to a shaft linking the rotating part of a generator, all enclosed in the nacelle. The energy thus generated is taken down the wind tower via cables and from there to the transformer platform associated with each wind farm for stepping up. Finally, the power is transmitted to the onshore electrical grids via submarine cables and from there to domestic users. But a problem faced in this context is the unpredictable nature of the wind resource. 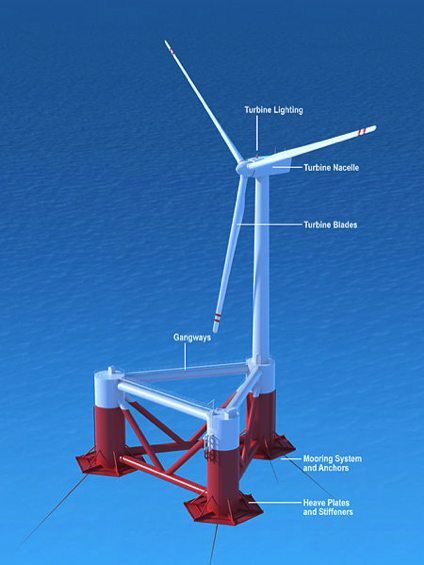 And as a redressal to it, SeaTwirl deployed their first floating grid in 2011 with wind turbines which possessed an additional feature, a fly wheel intended to store energy to maintain continuous energy supply though the wind has stopped blowing. It was yet another milestone in the advancement of these offshore wind turbines. One great advantage of these offshore structures is that they could tame the deadly hurricanes encountering them by reducing the peak wind speed. These wind turbines actually slow down the outer rotation wind of the hurricane and so is the wave height too which inturn slows the entire hurricane and dissipiates it somewhat quickly. This helps in reducing the onshore damage costs. Also, studies have proven that vertical axis wind turbines are further cost effective when compared to horizontal axis turbines, thus providing a solution to the drawback of high installation cost. Because, its careful designing could result in ten times more power output as compared to horizontal axis turbine of same size. Moreover, vertical axis wind turbines consumes only less space, thus we could accommodate more turbines in the space provided and they are quieter too. In the perspective of economic installation, almost all the assemblings are done onshore also and finally deployed by means of specialised vessels. The electricity generated in this way is absolutely green electricity since it lacks burning of any fuels resulting in the emission of green house gases. Thus, researches are going ahead to find effective remedies to these draw backs and to ensure the supply of this green electricity to millions of households in future. Adventures Knowledge for us & shall help in the future in INDIA also. Excellent work sajna.. it helped us for our project..
you mentioned so many advantages for vertical axis wind turbines, but I guess there are more horizontal axis turbines in commercial generation. Any reasons or am I wrong? and I am interested in off-shore wind Project. Excellent article Sajna! Thank you very much! It seems that the converters were from my company, so they must be very robust!